Barely ten days to the presidential election, the Ag. Inspector General of Police, M.A Adamu has ordered the redeployment of senior police officers to zones, formations and commands nationwide. This just as the Independent National Electoral Commission (INEC) has assured of free and fair elections. However, the Peoples Democratic Party (PDP) has threatened to pull out of the national peace accord it entered into with other political parties in the country few weeks ago. The IGP in a statement issued Thursday by the Force PRO, Frank Mba, said the IG charges the AIGs and CPs to diligently and professionally discharge their duties according to the laws, rules and regulations of the Federal Republic of Nigeria. 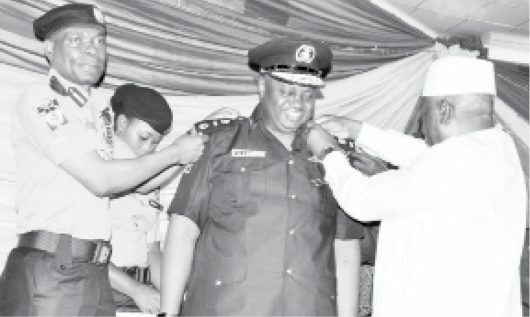 Others are CP Mu’azu Zubairu – CP Lagos State Command, CP Ahmed Iliyasu – CP Ogun State Command, CP Mohammed Wakili – CP Kano State Command, CP Austin Iwero Agbonlahor – CP Cross River Command, CP Damian Chukwu – CP Borno Command, CP Sumonu Abdulmalik – CP Yobe Command, CP Asuquo Amba – CP Ekiti Command, CP Abiodun Ige – CP Osun Command, CP Ibrahim Sabo – CP Niger Command, CP Alkasim Sanusi – CP Taraba State, CP Garba M. Mukaddas – CP Adamawa Command, CP Omololu Bishi – CP Benue Command, CP Bola Longe – CP Nasarawa Command, CP Isaac Akinmoyede – CP Plateau Command and CP Aminu I. Saleh – CP Bayelsa Command. Also redeployed are CP Adeleke Yinka – CP Delta Command, CP Bashir Makama – CP Akwa-Ibom Command, CP Awosola Awotunde – CP Ebonyi Command, CP Belel Usman – CP Rivers Command, CP Bello Makwashi – CP Gombe Command, CP Abdulrahman Ahmed – CP Kaduna Command, CP Bala Ciroma – CP FCT Command, CP Akeem Busari – CP Kogi Command, CP Galadinchi Dasuki – CP Imo Command, CP Suleiman Balarabe – CP Enugu Command, CP Dandaura Mustafa – CP Anambra Command, CP Etim Ene Okon – CP Abia Command, CP Ibrahim Kaoje – CP Sokoto Command, CP Celestine Okoye – CP Zamfara Command, CP Garba Danjuma – CP Kebbi Command, and CP Undie Andie – CP Ondo Command. On free and fair elections, INEC has assured that it will not fail in delivering credible elections to the nation. The Chairman of the Commission, Mahmood Yakubu gave the assurance on Wednesday while receiving a delegation of the ECOWAS Election Observation Mission in Nigeria, led by the immediate past President of Liberia, Ellen Sirleaf Johnson at the INEC headquarters in Abuja. “We are aware that the world is watching Nigeria. Let me assure you that the polls will be free, fair and credible”, he said. In her comments, the Head of delegation and former Liberian President, Dr Sirleaf Johnson pointed out that Nigeria’s election is very important to Africa and the entire world because of Nigeria’s contribution to development of democracy across the continent. Meanwhile, the leading opposition party based its threat on the latest comments by the Governor of Kaduna state, Mallam Nasir el-Rufai, where he allegedly declared that foreign election observers who interfered in Nigeria forthcoming elections will return to their countries in body bags. The National Publicity Secretary of PDP, Mr Kola Ologbondiyan, who issued the warning at a press conference in Abuja, also called on the international community to immediately impose a travel ban on el-Rufai for the comment which they said is against peaceful elections in our country. The party equally rejected the plot to redeploy, a former Chief Security Officer to APC leader, Asiwaju Bola Tinubu, CP Kayode Egbetokun, as Kwara State Commissioner of Police. While however reacting yesterday, the PDP said the comments, threats and incendiary actions by the All Progressives Congress (APC) and the Buhari Presidency, have been directly inimical to a peaceful, free and fair election. PLS BE CAREFUL WHAT YOU ASK FOR. PDP RUINED NIGERIA IS THAT DIFFICULT FOR SOME NIGERIANS TO UNDERSTAND?. APC is planning desperately to rig the forthcoming general elections, especially the presidential election. There will be consequences if INEC collaborates with APC to rig theses elections.